Starting a VPS for the first time is a big undertaking. In our DirectAdmin tutorial series, we explain how you start using a VPS with DirectAdmin. This not only includes hosting your website and email but also how you can safely set up and update your VPS. General information about DirectAdmin (for example, the differences between 'Admin, Reseller and User Level') can be found in our article 'what is DirectAdmin' (or try the demo) Order a VPS with DirectAdmin here if you do not yet have one yet. Setting up a solid, well-functioning VPS is an extensive and complex process. Do not skip any steps in this tutorial series unless explicitly indicated that they are optional. At the time of writing, the VPS is supplied with DirectAdmin 1.52.1 in combination with CentOS 7. Our default installation uses CentOS 7. In this manual, we assume that you also use this. In this article, command-line will be used in several places. You execute the commands via SSH or the console in your control panel. If you do not have any experience using command-line, we advise you to consult our article on command-line first for general information about command-line and the use of SSH. This article is intended to help you on your way in using a VPS with DirectAdmin. We do not offer support for setting up websites and advanced DirectAdmin options. What size of VPS do I need? You may wonder if you need an X1, 4, 8, or even larger VPS. Which VPS is suitable depends on a number of things, such as the number of websites and email addresses you want to host, the layout of the website(s), the number of visitors, etc. It is therefore very difficult to say exactly what you need. When in doubt, you can start with a smaller VPS and later upgrade to a larger VPS. It is not possible to downgrade a VPS because of the allocation of disk space on a VPS. If you host websites that use a CMS system (such as WordPress, Joomla, etc. ), consult the system requirements of the relevant CMS system. This gives you an idea of ​​the number of websites that you can host on a VPS. When ordering a new VPS with DirectAdmin, a hostname is requested. The syntax we recommend for this is server.yourdomainname.com. Your VPS installs your VPS and DirectAdmin automatically after ordering. While the installation process is running, you cannot make any changes to your VPS, such as changing the name of your VPS. Please note that you also create a DNS record for your hostname at your domain. An example of this can be found in the screenshot in part 4: Linking domains and subdomains to your VPS under 'DNS'. After installation, we will automatically send you an email with the password for the admin user of DirectAdmin and the root user of your VPS. Keep the password safe, because passwords are not transparent to us and are not stored. The email also contains the web address of DirectAdmin. This address is the IP of your VPS with the addition :2222, for example, 123.123.123.123:2222. When you visit this page for the very first time, you will see a notification similar to the screenshot below (but collapsed). The notification is shown because there is no SSL linked to the IP of your VPS. 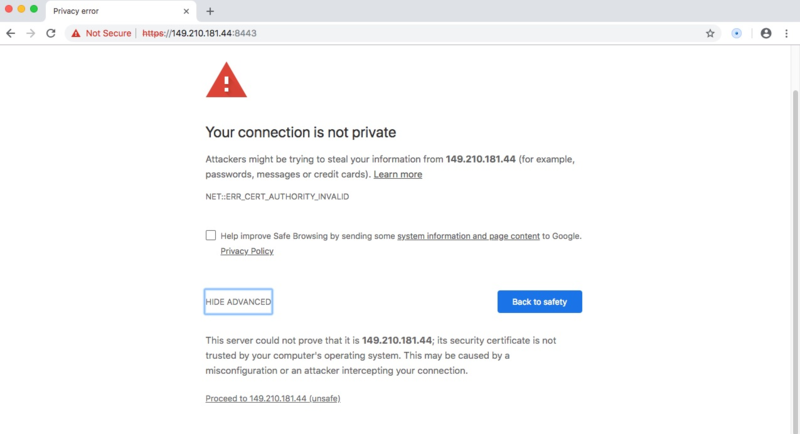 You will no longer see it after you have configured SSL and use your hostname instead of your VPS' IP to log in (further on in this tutorial series). Click on ‘Advanced’ and then ‘Continue to 123.123.123.123 (unsafe)’ to continue. You'll now arrive at DirectAdmin's login page. An exampleis shown in the screenshot below. Log in to DirectAdmin at 'Admin Level' with the login details of the user 'admin' and click 'List Administrators'. At the moment, there is only one administrator, namely 'admin'. Click 'admin' under 'Name'. Click 'admin's User Data' at the top right. Then, halfway through the page, adjust the email address and click 'Save Email'. Then use the 'Back' button at the bottom left of the confirmation page to go back. That concludes this introductory chapter. Click here to continue to Part 2: Securing your VPS.